The worst thing which can happen to a shower pan is for it to crack. 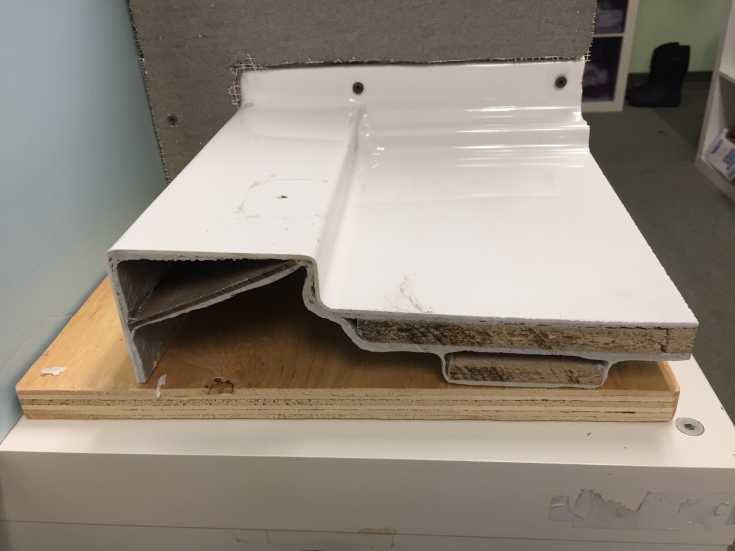 This can happen when the material is too thin and beds, the structure under the acrylic pan was poorly designed or the installation was done wrong. Here’s what I’ll tell you – which isn’t rocket science. Not all acrylic pans are created equal. The material thickness in these pans varies. Some are designed with ‘sub-structures’ to support them, with others you’re told to install a messy mortar base underneath. 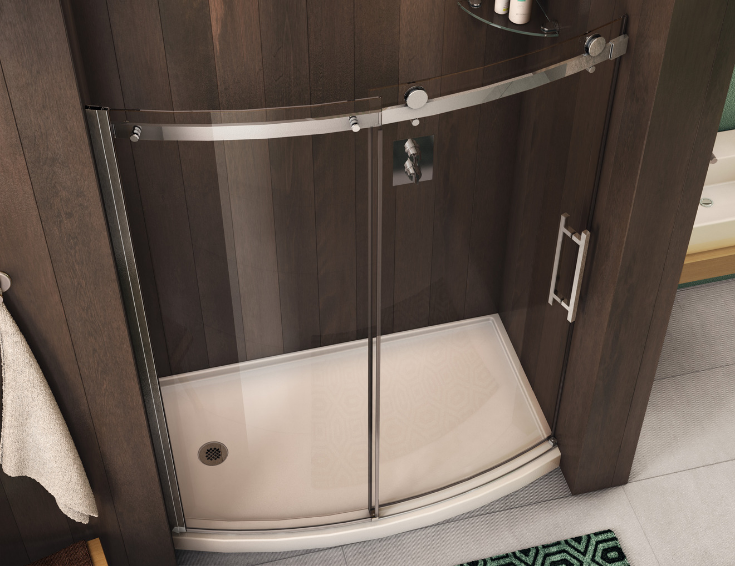 Whatever system you choose, you’ll want a sturdy acrylic shower base you know WON’T CRACK! You may be wondering; how can you find a sturdy acrylic shower base? I’d start with this smart idea. Use one which is reinforced underneath (and doesn’t have to be set in a mortar bed). In the image below, you’ll see a reinforced acrylic shower pan which uses MDF (Multi-Density Fiberboard) below it’s top surface to add rigidity. Does it cost a few bucks more? Yes, it does. However, since your shower base is the ‘foundation of your shower,’ you’ll be able to sleep better knowing you won’t spring a leak through your shower pan and onto your expensive dining room table below? Let’s face facts. Acrylic pans are made out of a mold. Manufacturers spend big-bucks to design and produce these molds. They want to use and use and use these molds to get the highest return on their investment. So, what’s the problem with this strategy for you? You see, these old molds may be used past their prime. People change. Our needs change (just think about how flexible you ‘used to be’ back in the day you were cheerleading or playing high school football – oops, sorry to depress you). While a 5” high step over curb designed in a mold 5 years ago, was ‘no-big-deal’ when you were younger, now you (or a family member) needs a shorter threshold for a safer entry. You don’t want to end up in the hospital slipping while getting in or out. In addition, clunky, rounded shower curb designs should have gone out in the 80’s with mullets, big hair and bell-bottom pants (although you may be able to bring your bell-bottoms back out because they’re coming back now). Fortunately, there are redesigned contemporary acrylic shower pans with low profile curbs (2” or 3” high) with sleeker lines. Don’t get stuck back in the old days. Dump the outdated acrylic shower pan. Use up-to-date units with shorter curbs for improved safety. Problem #3 – The ‘standard sized’ acrylic shower pan you bought doesn’t work in your ‘standard sized opening. Now what? Has this ever happened to you? You called your big-box store and told them you needed a 60” x 36” shower pan. They said, “Sure, come right in. We have it in stock.” You excitedly go to the store and grab the pan for your contractor. While this is a bummer, you’re about to find out its even a bigger problem when you learn, you can’t find a ‘standard” (that’s a remodeling code word for it won’t cost you an arm and a leg) entry on the side. Now you’ll either need a tile pan or a custom cultured stone pan. I’m glad you asked. Yes – there is. And it’s cheaper than a custom-made tile shower floor pan or solid surface base. It’s to use a specially designed acrylic pan called a FlexPan. You see the FlexPan acrylic base is designed without ‘flanges’ already pre-built into the side and with thinner curbs on 3 sides (note; the flange is a separate component you put on later). Therefore, this one pan can be used in 5 different ways. You can enter on the 36” side so the base can be used as a corner shower or side-loaded unit. 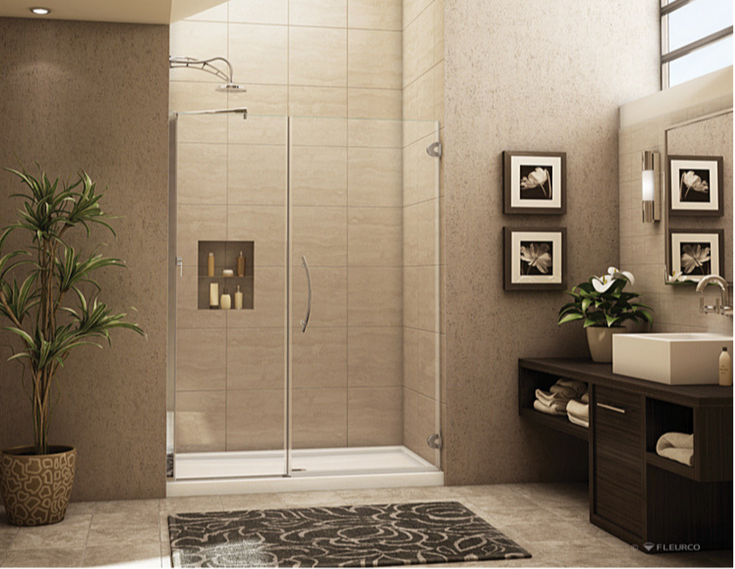 It can be used as a 3-sided glass shower or in the traditional way with the opening in the 60” front. It’s flexible. It can save you a lot of money for ‘non-standard’ entry points. If I told you your solution could start right under your feet (with a curved acrylic shower pan), would you believe me? Well it is. 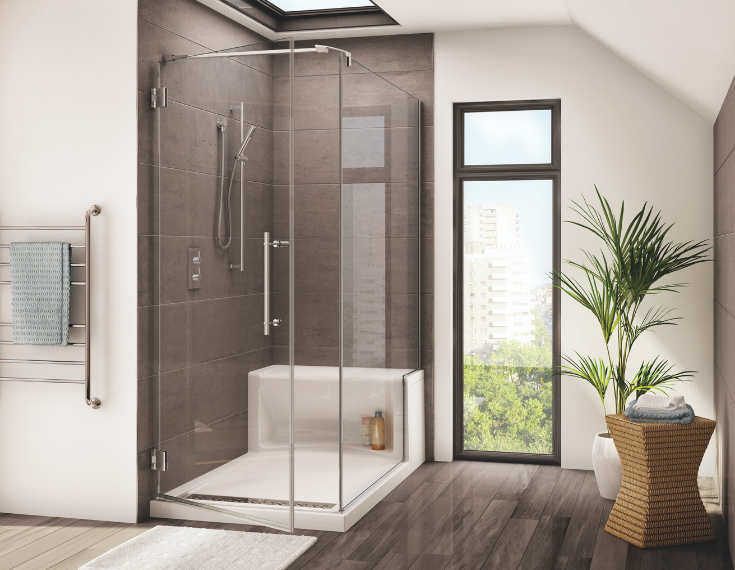 Instead of using a flat glass enclosure which is 30” deep (in the standard 60” wide alcove shower), ‘open things up’ with a pre-designed curved glass enclosure and base. This option not only looks cool, but it will stop (with its 36” bumped out in the middle design) the elbow-banging routine the big-boys in your family have been *itching (that’s a swear word there, but I can’t spell it out because this is a family-friendly blog) about for years! Problem #5 – Your shower storage is so lacking, even Marie Kondo couldn’t tidy up this mess. Can a new shower pan help? Your ugly (hang over the shower head) ‘storage system’ is pathetic. It looks like the $5.99 (dollar-store special) it was. You know you NEED more storage – especially since (as my wife would say), the number of ‘products’ needed to go from ‘wake up to pretty, keeps growing every year. Is there a way to hide these showering products and gain more space – without ugly white plasticky shower storage units hanging over the shower head? Well – one option is this uniquely designed acrylic base below which has seating AND storage in the same pan. That’s a cool design. Shower drain covers are the ‘Rodney Dangerfield’s’ of your shower base. Yes – you need a drain. After all isn’t your shower tray supposed to move the water away to the drain? However, wouldn’t it be nice if you could get the water drained without looking at an ugly drain cover in an out-of-date bright brass finish which went out of style years ago? Well -with a newly designed contemporary acrylic shower pans this is actually possible. The way this happens is with a hidden drain cover. This cover makes the pan appear as one continuous surface, but you still get the water drained away. You’ll be able to get rid of your ugly brass drain cover forever! Problem #7 – You HATE standing on top your drain in the middle of a pool of water when your drain is clogged. Is there a way to eliminate this problem, and have a cool looking shower at the same time? Standing in dirty shower water is enough to make your (already thinning) hair stand on end. It’s disgusting. You ask yourself, why was this pan designed so I have to stand SMACK DAB IN THE MIDDLE of this doggone drain? There are smarter designs which not only eliminate this problem but create a sharper look as well. This smarter design includes a linear drain. They’re made with sleek stainless-steel covers, move water away quickly and are located at the end of the pan, so YOU won’t be standing on top of your drain. Acrylic shower pans can be a blessing, or a curse. 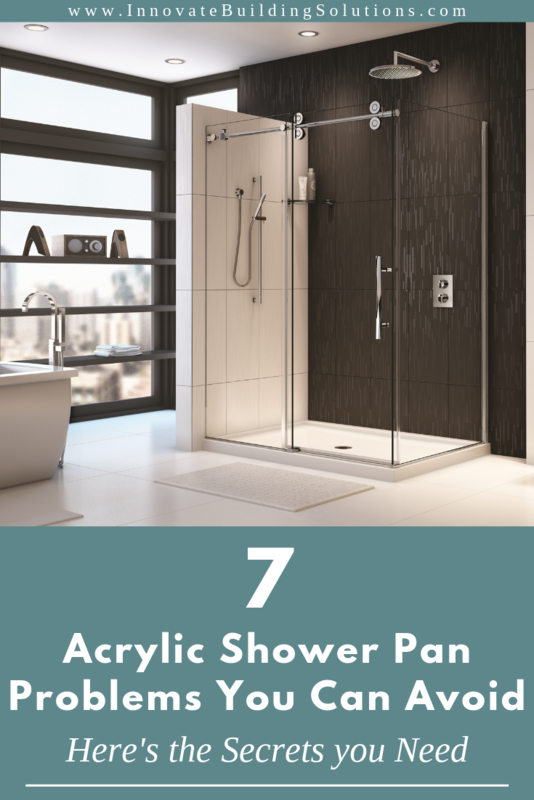 By using the 7 ideas above you’ll get rid of the weaknesses associated with low cost acrylic pans and can actually use them to improve the experience of using your bathroom. If you have questions about how to design a smarter bathroom and shower with an acrylic pan (or with grout free wall panels or glass enclosures for that matter) I (and my team) would be honored to help. Call us at the numbers below or click the links. We’re looking forward to helping you. For more information about contemporary acrylic shower pans or waterproof wall panels contact Innovate Building Solutions at 877-668-5888. For a local remodeling project call Cleveland Design and Remodeling at 216-658-1270 or in Columbus, The Bath Doctor at 614-252-7294.